The test drivers: Manfred Herrmann (left) and Dr. Ralf Hannappel making their way from London to Paris. 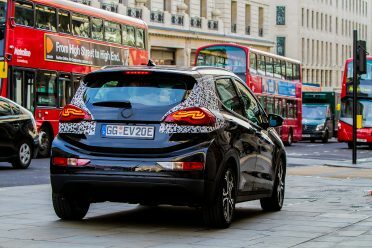 engineers Dr. Ralf Hannappel and Manfred Herrmann proved it in the Ampera-e.
London, England and Paris, France are legendary. Trendy London keeps people at the pulsing heart of things, while the fashion capital of Paris embodies a luxurious je ne sais quoi with its gorgeous boulevards and chic boutiques. Although these two metropolises are separated by a border and a body of water (the English Channel), it now takes less than a single battery charge to drive from one to the other – we have proof. 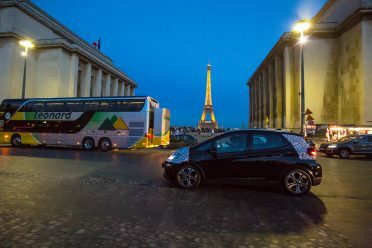 Driving the wide-range champion Ampera-e from London to Paris – in one go. Without stopping to charge the battery. The Google maps route planner estimated a route distance of almost 470 kilometers. Since this includes 50 kilometers traveled by train through the longest underwater tunnel in the world, the Eurotunnel, the total driven route amounted to about 420 kilometers. Recording: The Opel engineers were accompanied by a camera crew. Piccadilly Circus: The long-haul drive began at the famous London road junction. Incidentally, the red double-decker buses in the background are now also powered by an electric drive system. Development engineer Manfred Herrmann has been delving into the topic of electromobility at Opel for nearly 25 years now, and is a true expert when it comes to saving energy. Since he’s so well-versed in that field, he came along as a passenger. “We want to show that everyone can do it,” explains Dr. Ralf Hannappel, Director European Electrification. 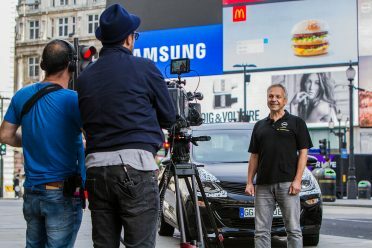 “That’s why I’m driving.” The morning sun shines down on the hustle and bustle at Piccadilly Circus as the two Opel engineers get ready to begin. It is 24 September, 10 a.m., right on the dot. In the background, Coca-Cola bottles glitter on a massive billboard, just like they’ve been doing since the ’60s. Herrmann and Hannappel yield to a red double-decker bus – another iconic symbol of London – and now, the long-haul challenge can begin. An ‘E’ on the license plate: Similarly to how an ‘H’ designates historical vehicles, the ‘E’ marks this as an electric vehicle. This license plate authorizes the vehicle to park at charging stations or use the bus lane, in keeping with the Electromobility Act that went into effect in Germany in June 2015. It starts out tough. The morning traffic in London gives the test drivers more than enough time to closely observe the sights that they slowly pass by, meter by meter: Big Ben, Westminster Abbey, and more. And this isn’t even a weekday. Ralf Hannappel is taking a laid-back approach to the situation: “This is a realistic driving scenario.” The engineer selects the ‘Low’ driving mode. The braking effect of the engine not only increases recuperation, but also allows the engineer to glide though the concrete jungle using only his right foot. Whenever he lifts his foot from the pedal, the vehicle brakes – if necessary, it stops completely. “It makes even stop-and-go traffic a pleasure,” he says. The left pedal (the brake) only needs to be used in emergencies. Because of that, the engineers refer to this as ‘one-pedal driving.’ After leaving Maidstone, the traffic finally clears up, and after a good 110 kilometers they’ve finished the first leg of their journey. They travel the next 50 kilometers from Folkestone by train shuttle through the Eurotunnel. Engineers amongst themselves: Manfred Herrmann and Ralf Hannappel discussing an interesting topic – the technological finesse of the Ampera-e. The Ampera-e recuperates automatically in Drive mode by recovering power from the electric engine, which becomes a generator. This happens every time Ralf Hannappel lifts his foot from the pedal in Drive mode. The engine assembled in the front end boasts 150 kW/204 HP, is fed a capacity of 60 kWh from the batteries under the floor, and makes virtually no noise. 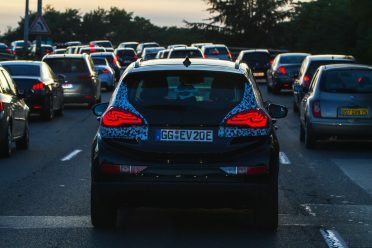 The energy-efficient Ampera-e glides across the French highways. Usually. 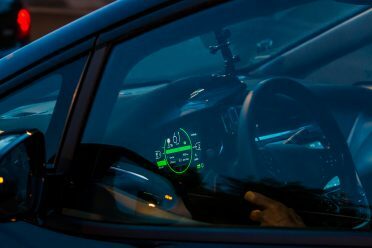 “After we pass through the toll stations, my right foot itches,” reports Hannappel – the desire to test the acceleration power of the electric vehicle with sports car capacity becomes overpowering. The Ampera-e can go from 0 to 100 km/h in 7.3 seconds. Hannappel puts the pedal to the floor and gives the vehicles with combustion engines behind him a brief wave in the rearview mirror. The maximum speed of the nimble electric car is limited electronically to 150 km/h to benefit the range. The driver is reined in by that limit, as well as by his passenger’s raised eyebrows, and Hannappel lifts his foot from the pedal. Realistic conditions: 20 kilometers outside of the Paris city center, they hit stop-and-go traffic again. Reaching the goal at 61 km/h: This photo was taken shortly before the drivers reached the Eiffel Tower, at kilometer 414. The display reveals that the battery has capacity for an additional 85 kilometers. The sun is already low in the sky when the testers approach the Paris inner city. The traffic becomes tough once again. The last 20 kilometers take an hour to cover. 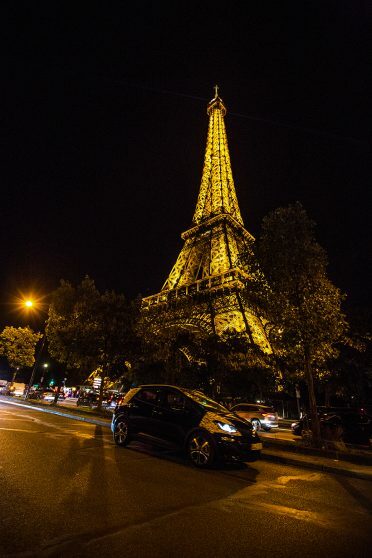 At 7 p.m., they’ve made it: The Eiffel Tower appears in front of the windshield. After they’ve parked the nimble electric vehicle in front of the iron architectural marvel, a look at the display reveals that Hannappel and Herrmann have covered 417 kilometers with the electric drive system. And the batteries still have ample power left over: enough to cover 80 kilometers. That means the eight kilometers left to the Paris trade fair grounds are a piece of cake. 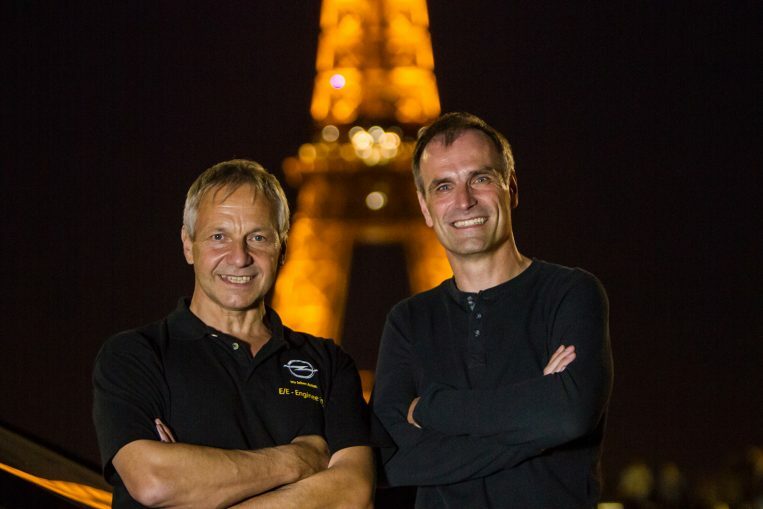 Proved it was possible: Manfred Herrmann and Ralf Hannappel in front of the Eiffel Tower. They then drove a further eight kilometers to the Paris trade fair grounds. 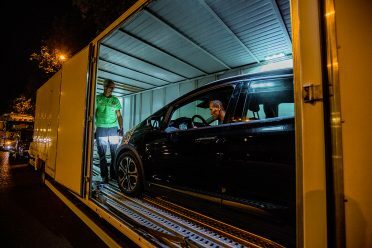 Back to Rüsselsheim, Germany: The Ampera-e made its way back home in the cargo area of a truck. It had to be back in time for its next big event – the internal world premiere in an auditorium filled with hundreds of employees. 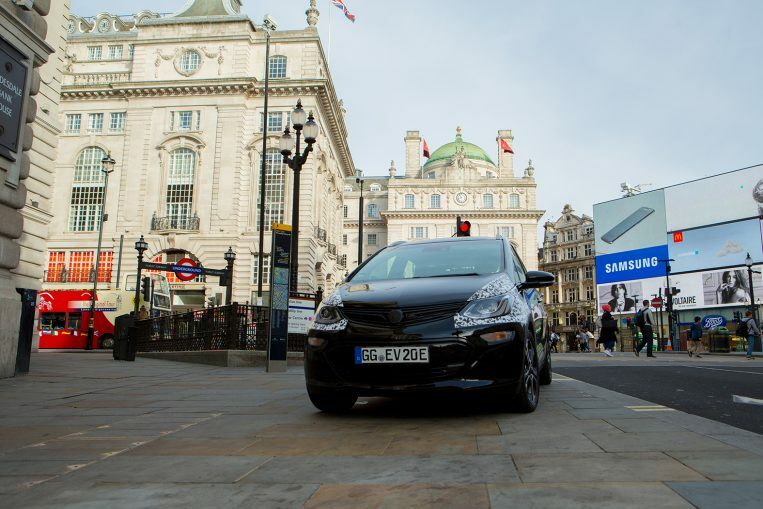 VIDEO It now takes less than a single battery charge to drive from London to Paris.